This excerpt from the Matsya Puran mentions a certain rishi Jatukarnya as the priest designated for Vedvyas incarnation of Lord Vishnu. The same list has been shared in a different question. For a person to be the officiating priest of the compiler of Vedas, he has to be exceptionally gifted! I want to know who this rishi is and if there are any details mentioned about his genealogy or life in any scripture. The great Vedavyasa was born as Satyavati‘s son. Vedavyasa learnt the Vedas from the great sage Jatukarna. He also composed the Mahabharata and the Puranas. Jatukarnya or Jatukarna was 27th Vyasa. Jatukarna was 27th Vyasa after him (26th Vyasa). 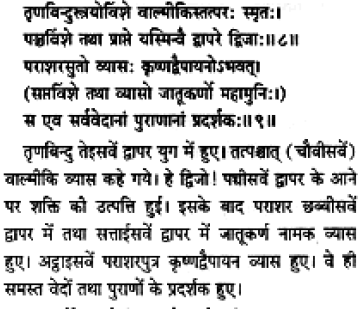 Kurma Purana also mention Jatukarna as 27th Vyasa. Linga Purana also mention Jatukarna as 27th Vyasa. Note: At first glance it seems that this is same Jātūkarṇya (who was priest of Vyasa) but still this is subject for verification. If some one can provide counter arguments, this can be searched further. Not the answer you're looking for? Browse other questions tagged vishnu avatars rishi vyasa matsya-purana .